I went down to the Treetop Lounge (yes it’s on the main floor, not at the top as the name suggests!) for Hymn sing. It’s every Wednesday afternoon at 2:30. A lady in her nineties comes from The Manor, the other building in this complex, and plays the organ… and pastor Ken plays guitar. Today he had lost his pick and asked one of the ladies to see if there was one in the drawer…No, not there. I had just come home from an errand, and went right there, so still had my purse with me. I said I had a pick, but would only loan it to him… he had to give it back! He reluctantly gave it back. 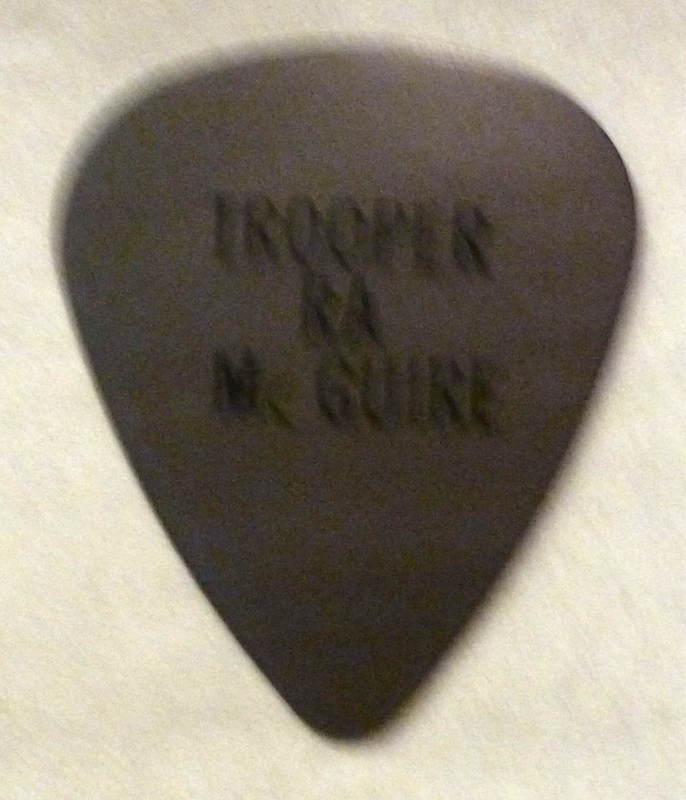 Written on the pick was “Trooper.. Ra McGuire” My son gave it to me many years ago, and it is always in my purse with my change. Funny how that worked… I don’t carry my purse with me unless I have been out. Half way through the program, the lights went out. Heard later that someone hit a pole and the transformer went”that a way.” We carried on with just the guitar. The organ was now out of commission….no power! I was going to sit in my favourite chair and see if I could have a nap… no.. it’s one of those operated by electricity …. one that lifts you to make rising a little easier. We take electricity so for granted that we don’t even realize what the loss of it can do. No TV, No computer, no Printer, no Fridge, no Lights! 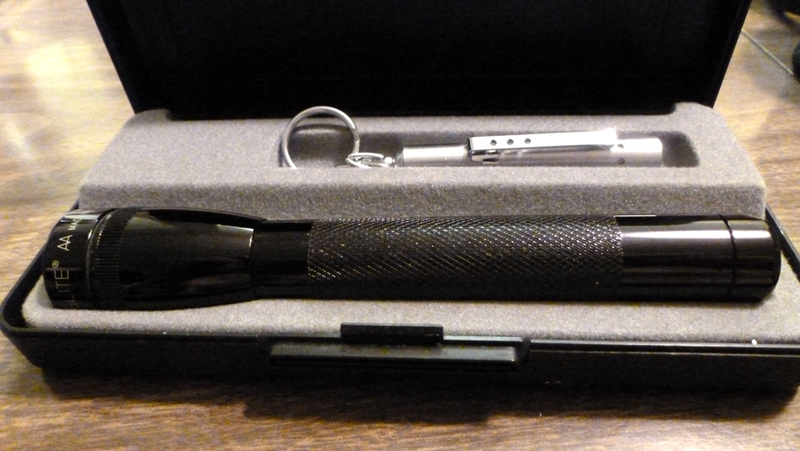 While it was still early afternoon, we had time to go home and look for the flashlight, and change the batteries! Mine was a gift from my son, Ra, the kind that Trooper use when needed. The light came back on at seven thirty, so we got back too a more normal evening. Hi, Norma 🙂 Nothing like a little excitement to realize how much we sometimes take for granted when it comes to electricity. Thank goodness for accoustic guitars and wonderful sons who make sure their moms have all the necessities! It’s a little early for tea… we should have coffee this morning!v Thanks for coming by and commenting.. although meeting in person the other day was so much better! Sounds like there was excitement in your life then and you are right we take electricity all too much for granted. Hearing you talk about Ra and Trooper reminds me about the time our daughter, Christina, was visiting mom and you had had them down to visit and Ra had come over to see you an Christina got to meet him. She was so thrilled and told all of her friends about it. It was an exciting weekend for her as she also went out to my cousins and met her cousin Dale Martindale from Images in Vogue music group. I find reading your blog also brings back great memories for me. So good to see you here, Bev… one old memory leads to more, doesn’t it! The coffee pot is on, so sit a while as we visit. How I wish we could! We go back a very long way! Say Hi to your Mom for me. Providence indeed 🙂 I always look forward to seeing you pop up in my email. I enjoy reading what you enjoy sharing . Good morning Kallie and Norman. Thanks for stopping by. The kettle is on, so tea will be ready very soon. Pull up a chair and sit a while.